A pioneer in the fashion industry, Miss Me™ was founded in 2001. Based in Los Angeles, CA, the American brand set out to revise the rules of modern denim with an updated look by incorporating heat-set beading and heavy stitch attributes. 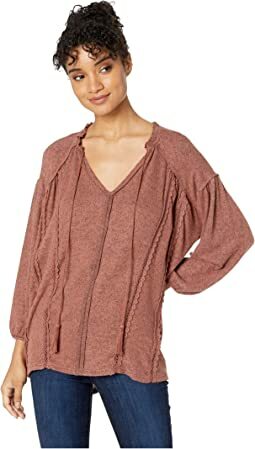 The brand’s eye for detail makes any woman feel beautiful with closet staples like fashionable knit-tops, sweaters, dresses, jackets, and jeans. Miss Me™ captures the many identities of a woman and expands the collection by creating each style with a fashion-forward mindset. With an array of competition to choose from, the company ensures a wide variety of clothing while embracing the feminine appeal by utilizing pastel shades, floral pattern, and lace details to offer a sophisticated look. With the brand evolving to everyday modern style, the focus is to stand out on their own by creating stylish pieces for every occasion. These versatile pieces represent character and style and can easily be utilized into your everyday wardrobe, allowing Miss Me™ to be your new go-to brand. Very cute looking jeans. Comfortable, and a good inseam for my long legs. 5’10, 150, got a 28 and think they are just a hair too big once worn. Fancier than a tshirt. Pretty lace shoulder. I tried the medium and the large. I am keeping the large just because it was slightly roomier around the bust. I am a 36C. The medium would have worked though. This is a really cute top. I wish it came in other colors. I would order those, as well. Zappos is great! An oversized fit but really cute and surprisingly flattering.